Manufacturing high quality low cost Clip Strips, Hang Tabs, S Clips, Adhesive Hooks and Shelf Wobblers. 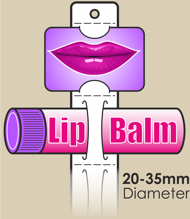 We have a wide range of hang and display solutions, which are quick and easy to apply. Our products are currently hanging and displaying millions of retail articles in-stores. We only use the best plastics and adhesives available on the European Market. Feel free to request samples before purchasing online. If we receive your email request before 2pm the samples will leave on the same day (First Class post). Print our New Leaflet ( 988 KB ). We also offer Custom Made designs for all our Customers. Our design team can create new hang tab and clip strip technical drawings in compliance with your specifications. 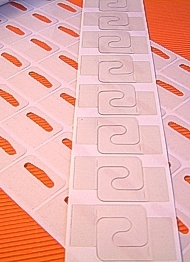 Manufacturing new hang tabs only two weeks from approval and clip strips within three weeks. 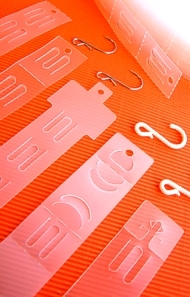 Our Hang tabs are produced from 275 micron A-PET (crystal clear) with a strong quick grab Hot-Melt adhesive applied. A-PET is non-toxic, 100% recyclable and environmentally friendly. Hang and Display Solutions your products can rely on!